I’m sure we can agree that dogs are awesome companions, but some may experience potty problems. For best results, you should deal with pee accidents as soon as they happen or else your dog will surely come back to remark his spots. Enzymes have been shown to work extremely well in cleaning dog urine. Sure, you can reduce the chance of house soiling by following some basic indoor potty-training tips, but it is still important to have a cleaner within reach so you can take care of any issue quickly and effectively. Our Pick? Rocco and Roxie Pet Odor Eliminator. Click here to check it out on Amazon. Luckily, there are a bunch of options out there that can help eliminate urine stains and odors in your house. In this review, I will pick the best enzyme cleaner for dog urine and talk about how to choose a safe one for your household’s needs. I will also mention an alternative product and discuss on cleaning your carpet after potty accidents occur. How To Choose An Enzyme Cleaner For Dog Urine? If your dog accidentally makes a mess indoors, simply cleaning the pee spot with soap and water is not enough. Even though you may think you have removed all of the urine’s residue, keep in mind that dogs have a far superior sense of smell (about 10,000 times greater than the average human). If your dog smells the scent of its last mistake, there is a chance he will go in the same area if he finds itself in a stressful situation. So the best thing to do is to remove any trace of it by using a cleaner with enzymes which basically “eats” the odor-causing cells. Of course, you must always double-check to see if the product is safe to use in a house with dogs (it should be labeled as non-toxic for pets) to make sure it does not contain harmful chemicals. Next step, you need to check if the cleaner can be used on furniture and carpets. 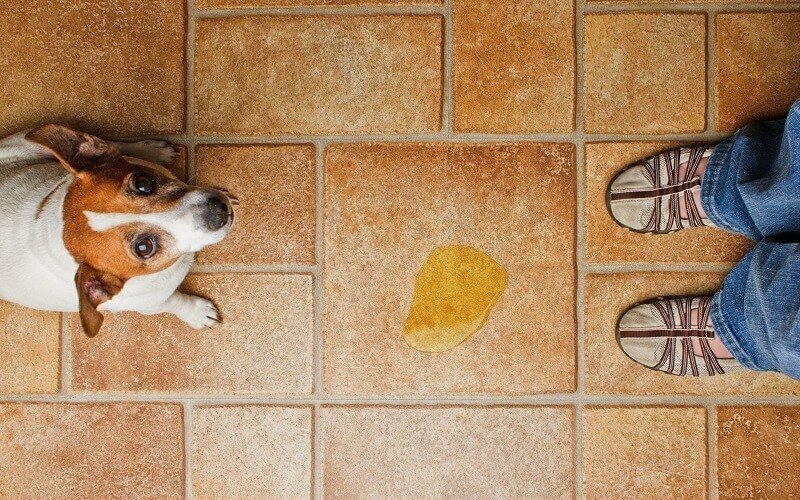 You never know where the next potty accident will take place, so ensure there are no harsh ingredients like bleach (which can ironically, worsen your dog’s marking problem), or opt for a natural cleaner if you want to be on the safe side. Most enzyme cleaners can also handle stains, so if that is something you need, find one that does a good work. Amaziing Solutions is an odor eliminator and stain remover for pet urine, effectively treating messes from dogs as well as cats. It contains powerful enzymes that neutralize odors which means that your dog will be discouraged from returning to the same spot in the future. Additionally, this cleaner instantly dissolves stains on first contact, therefore there is no need for scrubbing. It is also safe for use on multiple surfaces, so you will not have to worry about damaging your floors. Certified by the Carpet and Rug Institute, this product uses eco-friendly, non-toxic ingredients and it is perfectly safe to use around your pets and children. In spite of how effectively it cleans, there is no harsh chemical or overly perfumed scent left behind. Instead, the treated area is left with a subtle fresh smell that is very discreet and pleasing. To ensure that you are one hundred percent satisfied, there is a lifetime satisfaction guarantee! Amaziing Solutions pet odor eliminator makes potty-training your dog a breeze, as it quickly removes any trace of potty accidents indoors and helps prevent urine-marking behavior. BUBBAS is a highly potent enzyme cleaner for treating floors and carpets. It uses enzymes to handle persistent pee odors, which makes it perfect for preventing your dog from visiting his latest accidents. Furthermore, this cleaner includes a dormant bacteria that feeds on the urine mark to remove any residue. Plus, it is quite versatile as it can also be used on pet beds, and clothes, as well as on your car upholstery or tires. Aside from removing pee spots, this formula is effective at cleaning other stains as well, like red wine and vomit. It also neutralizes unpleasant odors on clothes and within the home. This product is made from green, natural organic ingredients that are safe for your dog and the environment. The scent is not excessively heavy, but it has a bit of chemical smell which dissolves pretty quickly. BUBBAS pet odor eliminator uses a formula that removes stains and odors quickly and completely. Its all natural, environmentally-friendly blend can be used on multiple surfaces without causing damage. Natural Enzyme is a super concentrated solution that is mixed with water and applied directly to the carpet or other surfaces for removing odors. It uses a multi-enzyme formula to break down the actual organic matter causing the odor, rather than simply mask it. This cleaner is incredibly flexible, capable of removing different types of stains and also being effective on carpets, floors, upholstery and even mattresses and dog beds. It is also all natural and environmentally friendly, so you do not need to worry about exposing your pets or children to harsh or toxic chemicals. Although the smell is a little overpowering at first, it is quickly dissipated once you add water to the concentrate solution. This is a wonderful option for removing pet stains and odors, along with being an overall useful cleaning tool to use on the entire home. Rocco & Roxie is a bio-enzymatic stain and odor eliminator that is a favorite amongst pet owners. It can fix your dog’s marking problem by effectively handling ammonia residues. You can use this cleaner on just about anything, including furniture, clothing, kennels, carriers and even cat urine. Plus, it can help you get rid of stubborn stains (you may have to treat the area more than once for optimal results). The formula is also one of the few that has the Carpet and Rug Institute (CRI) Seal of Approval, meaning you can use it on your carpet without having to worry that it will get ruined or become stiff. This product contains a natural enzymatic bacterium, which is not only friendly to your dog, children, and the environment, but it also doesn’t include hazardous ingredients (such as chloride). The smell is a bit too sweet, although it slowly dissolves until it leaves a fresh clean smell, unlike some other household cleaners. As an added bonus, you have a 100% satisfaction guaranteed policy in case you are not pleased with the results and want to ask for a refund. Rocco & Roxie stain and odor eliminator is a great choice for treating your carpet, furniture and other places in the house. Free from any overly harsh or hazardous ingredients, your home is left clean and smelling fresh. Sunny and Honey is an enzymatic pet stain and odor remover that can help stop repeated marking by your dog. It works well on new and old accidents without damaging the affected area. You can apply this cleaner to your carpet, rug, hardwood floor, furniture, leather, pet bed, crate, and even inside your car. And in addition to dealing with dog urine, it can also get rid of vomit and drool stains successfully. You will not find any harmful chemicals in this product, so feel free to use it inside your house and near your pets. In addition, 10% of the profits from each purchase will be donated to animal rescues and shelters! The strong mint smell can be a little overwhelming for people who are sensitive to odors and fragrances. If you are not satisfied, you have 60 days to ask for a full refund. Sunny and Honey pet stain and odor remover is ideal for cleaning carpets, as well as hardwood floors and even messes inside your car. It uses non-toxic, yet highly effective ingredients and provides you with speedy and impressive results. XIONLAB is a commercial enzyme cleaner that removes pet odors from carpets and floors. It contains enzymes which attack the molecules of the urine until they are liquefied, removing all trace of any odor. Extremely versatile, you can use this cleaner to also treat rugs, hardwood, and clothes, as well as mattresses and furniture (including removing hard stains). This product uses enzymes action rather than relying on harsh chemicals. This means that you do not have to worry about your pet or children, as it is completely non-toxic and environmentally safe. Unlike other cleaners which smell harsh or overly chemical, this one has a pleasant, if somewhat initially overpowering scent. XIONLAB is a powerful yet safe cleaner to remove stains and odors from your carpets, floors and many other surfaces. It permanently removes all trace of any previous mess, ensuring your dog will not revisit the spot. My Pet Peed is an oxidized-based pet odor eliminator that is made by an ex-carpet cleaner. Therefore, it is not surprising that it is highly effective at cleaning dog urine from carpets and rugs. This cleaner can handle fresh and older stains instantly, without having to scrub or rinse. It even works on tough spots that have been rubbed into carpets. But keep in mind that you may need to treat the spot more than once if it is an older stain. Unlike some pet odor products, this one does not contain salt. This is a bonus, as salt only serves to dry out the bacteria rather than eliminating it. It also does not contain any harsh chemicals, bleaches or fragrances, and will not leave any residue once it is dried. Instead of an air freshener that is meant to mask bad odors, this deodorizer will remove the bacteria that causes the bad smell. After applying it, you may notice a mild fresh scent. My Pet Peed pet odor eliminator is an excellent option for cleaning fresh stains or treating old, stubborn ones. It will also remove any trace of odor from your carpet, leaving behind a pleasing scent. If your pet has experienced an accident or two on your carpet, you can use the following steps for cleaning fresh or old stains, along with removing odors from your carpeting. First, absorb the dog urine as quickly as possible. If the incident has just happened, simply use dry paper towels to sop it up. If it is an older, dried-on stain, you will need to first use water to wet the area. Wait until the liquid reaches the padding of the carpet and let it sit for a few minutes. Next, soak up excess water by using dry paper towels. Then apply the cleaner, and wait until the product reaches the padding of the carpet. Finally, cover the stain with a dry cloth, and leave it overnight, especially if the stain is old and persistent. The Rocco and Roxie Pet Odor Eliminator will tackle potty accidents while your dog is still learning the ropes. It is also the safest enzyme cleaner you can use on your carpet, although you may have to use it more than once to get rid of older stains. For me, it is the #1 choice for dealing with marking issues as part of your housetraining, and the best enzyme cleaner for dog urine. Click here to check it out on Amazon. Whatever you choose, do not settle for less than a high-quality product. Always look at the ingredients list to make sure they are safe for your dog. Additionally, take the time to go through the instructions so you know you are doing everything correctly.